I shouldn’t be so surprised that it was really six years ago when I left Boston for parts unknown and wound up in Seattle, but the anniversary snuck up on me just the same. And another anniversary passed by completely unnoticed earlier this year — 10 years of blogging, come and gone. And, now that I think about it, it was 17 (!) years ago in May when I first started working at NIST, where I did some early web programming. Even that was “later” in my tenure there. When I first arrived, we struggled to format scientific papers for the web as HTML didn’t (yet) have provisions for super- and subscripts. One of my first tasks was to modify a LaTeX-to-HTML translation program to automatically create images for superscripts, subscripts and equations that would then be included, in-line, with text to make it look like it was originally intended. Not a bad hack, and pretty cool that a government organization was on the leading edge of using technology (publishing physical reference data for free on the web) as well as developing it. For pretty much the first time in the 3+ years I’ve been going to China, I’m taking some time to do some non-work travel. Abe and I met up in Guilin on Sunday, and have been having a fantastic time in Yangshuo this week. The landscape here is truly unbelievable — everywhere you turn is another spectacular vista. 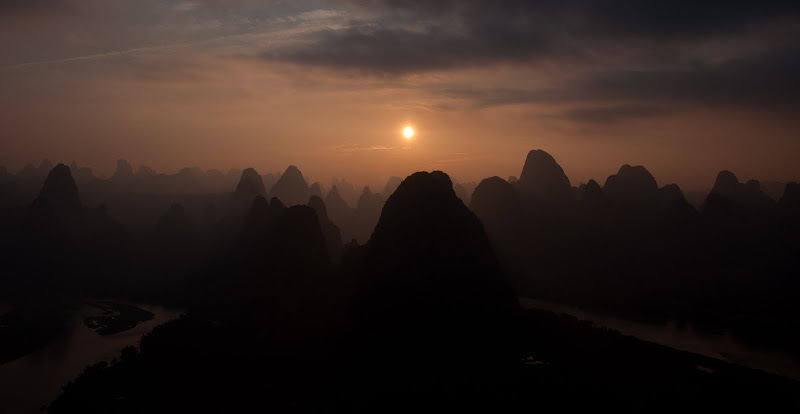 And after a solid day of solid rain, the weather’s been cooperating marvelously; we’ve enjoyed some magnificent sunrises, sunsets and views of the moon, all with the Li River Valley karst hills as a backdrop. It’s magical.